Someday, I will meet a book or essay deadline with a week to spare. I will be calm, having lost no sleep, and having also kept life at a fairly ordinary rhythm in the meantime. I will also have maintained a normal round of blogging and email answering, thus giving evidence of my continued health and capacity to write to begin with. That day has not yet come. I tend to meet deadlines in a writing vortex; I eat, breathe, sleep, and think the book to completion and all else falls by the wayside until the moment the thing has to be sent off. But meet my deadlines I do and I submitted the Book Girl manuscript at 3AM last Friday morning, with my husband nearby plying me with water and gummy bears (you'd be surprised at how effective these can be in maintaining mental strength) and all the candles in our little living room lit to keep me awake and inspired. My friends, Book Girl is on her way into the wide world. And having emerged from the vortex I can greet you here again. As I write from my spot in the Wycliffe Library on this relaxed afternoon, the sun, a blessed sun that feels like a gift in the midst of autumn's growing grey, flickers over my hands. Leaves shimmer gold in the wind, the air is easy and cool and my mind turns afresh to the grace of this moment, the gift of the ordinary splendor in such wild play out the window of every day. I think I see with even a little more gratitude than I did before because of the books I've been reading over the summer of writing, and the way they have shaped my idea of what it means to be a writer, and what I receive every time I read. One of the books I discovered is Robert MacFarlane’s slim little bound essay The Gifts of Reading. I first read MacFarlane several years ago when I found a copy of his The Old Ways: A Journey on Foot. The book was part contemplation, part real-life novel, part history, part literary ramble centred on the his fascination with ‘landscape and the human heart’. In ordering his little essay I discovered his most recent book, a glory of a children’s picture book written to help modern children reengage with the fading language and ever-present mysteries of the natural landscape. And it has won my heart. 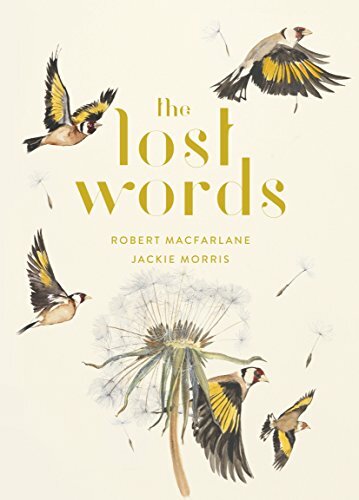 The Lost Words is a luminous, lyrical book of illustrations that evoke the movement and essence, the ordinary miracle of things like 'dandelion', 'otter', 'bramble', and 'acorn'. I've seen snippets of it online and perused it at the bookstore (it's on my 'please-someone-get-me-this-for-Christmas-list) and what I find in its pages is the sense of something created as a gift. It reminds me of the Millais painting of a blind girl sitting under a rainbow and the girl beside her describing it (an image that was deeply meaningful to me). This is, in a way, MacFarlane's and his illustrator Jackie Morris' way of 'writing the rainbow' for the children who can't see it and in that description, beginning to heal the blindness. In writing Book Girl I have become deeply aware of the fact that as a writer, I speak from what I have been generously given. I am a lover of books, a student of theology, one who can wonder at the world because so many people before me - my parents, my favorite writers, the friends who pressed good books into my hands, the tutors here at Oxford who were faithful to communicate what they had discovered - were generous with their words. They spoke me into wonder. They startled me awake. They took me by the hand of mind and soul and pointed at the rainbow. My great hope for Book Girl is that it will be the same. A giving of thanks that begins the vision for another reader. If that could be the case, I think the vortex would be worth it.